Brooms are a group of shrubs in the bean family. Common broom species include Spanish broom (Spartium junceum) and Scotch, or common, broom (Cytisus scoparius). The Scotch broom is larger than the Spanish broom and has arching stems. Both species bloom yellow flowers. Brooms are easy to care for, requiring little water and no fertilizer. Some states, such as California, have listed these brooms as invasive plants. 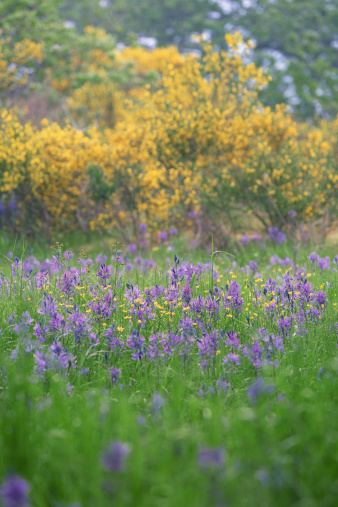 In Oregon, it is illegal to propagate or sell the Scotch broom. Prune the broom bush after it finishes flowering. The Scotch broom can get rather bushy if it isn't pruned. Go through the bush removing dead and damaged wood, especially that toward the center of the bush. Cut these canes back to their points of origin. Remove branches or stems that cross over others and any that protrude from the shape you desire for the bush. Pinch 1/2 inch from the tips of new growth when it reaches 2 inches in length. This prompts the broom to produce a new branch directly beneath the pinch portion, making the shrub bushier. Rejuvenate Scotch or Spanish broom by cutting or mowing it to the soil while it is dormant. It will rapidly grow back, producing new, strong stems.